Author(s) Strandburg, Katherine J.; Frischmann, Brett M.; Madison, Michael J. 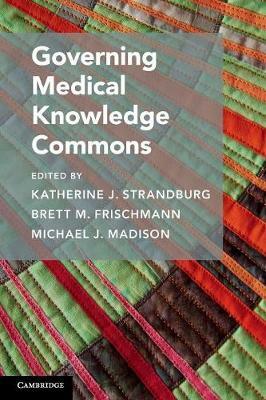 Governing Medical Knowledge Commons makes three claims: first, evidence matters to innovation policymaking; second, evidence shows that self-governing knowledge commons support effective innovation without prioritizing traditional intellectual property rights; and third, knowledge commons can succeed in the critical fields of medicine and health. The editors' knowledge commons framework adapts Elinor Ostrom's groundbreaking research on natural resource commons to the distinctive attributes of knowledge and information, providing a systematic means for accumulating evidence about how knowledge commons succeed. The editors' previous volume, Governing Knowledge Commons, demonstrated the framework's power through case studies in a diverse range of areas. Governing Medical Knowledge Commons provides fifteen new case studies of knowledge commons in which researchers, medical professionals, and patients generate, improve, and share innovations, offering readers a practical introduction to the knowledge commons framework and a synthesis of conclusions and lessons. The book is also available as Open Access.